The VR gaming ecosystem had some solid experiences carrying all the weight for most of 2017, titles like Lone Echo, Resident Evil 7: Biohazard, Wilson’s Heart, Audioshield, and others. Some big heavy hitters arrived late to the party, with DOOM VFR and Skyrim VR arriving in the Fall. Those two showed average consumers that big players in gaming were taking VR seriously and that energy continues into 2018. Here are but a few of the VR games we’re most excited to play this year. Ubisoft has been one of the most notable names to dip a toe into the virtual pond, knocking it out of the park with Star Trek: Bridge Crew in 2017. In 2018, Ubisoft Montpellier is set to release the jet-pack fueled, zero-gravity VR shooter Space Junkies. I had an opportunity to play a 2v2 match at E3 2017 against the developers and the game felt wonderful. Locomotion in zero-g felt fluid and the game’s weapons were fun to play around with. There were your typical handguns and assault rifles, but there’s also a slingshot with bombs. Yup. Air combat simulators aren’t typically known for enthralling narratives, but the Ace Combat series is typically thick with drama. There are intriguing twist and turns in the world shaped by this franchise and, on top of that, is a very fun flight experience. Sadly, it’s not entirely known how much of Ace Combat 7: Skies Unknown will be VR. There’s a mode dedicated to virtual reality and hopefully, if the game performs well, more content will be added down the line. It’s already an accomplishment for Zone of the Enders: The Second Runner to be getting an high-definition remake, but it’s an absolute treat that the devs will be including a VR mode that allows players to play the entire game in VR. The thing is...you’ve gotta wonder exactly how this is going to work. Zone of the Enders is a high-speed mech action game (heavy emphasis on “high”) and motion sickness is a righteous concern here. If the team responsible for this mode finds a way to create an engaging and comfortable VR experience without sacrificing too much of what makes Zone of the Enders great, we could have an absolute hit that inspires the many creators out there that are crafting their dream virtual reality mech games. Pavlov VR and Onward have set a pretty solid bar when it comes to military-style shooters in virtual reality but developers at Mardonpol Inc. are aiming for one of the biggest shooters ever with their upcoming VR shooter Alvo. Counter-Strike has a spot in gaming history etched into stone and continues to be a mainstay in the competitive scene. If Alvo even achieves a chunk of CS:GO's impact, look for the landscape of VR to be shaken up in a good way. Robbing a bank in PAYDAY 2 with your friends is some of the best fun you can have in gaming and we’re getting the opportunity to this in virtual reality later this year. OVERKILL, the studio behind the PAYDAY franchise, has already created a plethora of content for PAYDAY 2, so they the VR version of the game could supply us all with nearly endless heists to immersive ourselves into. Our list a couple months late, so a couple of the most anticipated games have already released. 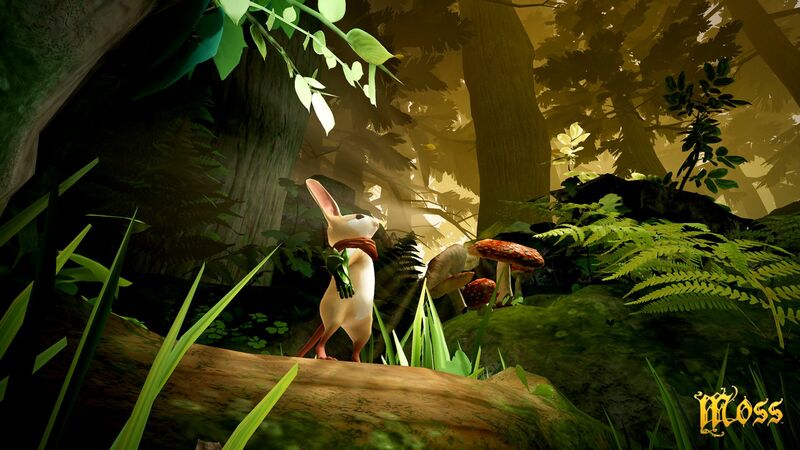 Moss from Polyarc is available now and we’d all been looking forward to helping the incredibly charming and cute Quill in her journey through a dangerous fantasy world. Our writer Blake Morse finished the game and recently dropped the review of Moss, so be sure to go read up! In short: It deserved a spot on this list and executed in nearly every way. Brass Tactics is another highly-anticipated game of the year that is already out and it does not disappoint. RTS games with a legitimate tabletop RPG feel was something many fantasized about in the earlier days of VR content and Brass Tactics has brought it to life with a steampunk style to it. I’m working on the full review, but I can tell you know this is one you’ll want to add to your collection of games. What ever happened to “budget cuts”?